Until last year, when an economic slowdown deteriorated into a full-blown recession, Michigan was widely acknowledged to be in a position that seemed impossible barely a decade earlier. The Great Lakes State was enjoying record low rates of unemployment, a thriving economy, growing educational opportunities, and a sense of accomplishment and high spirits. After years of a "Rust Belt" reputation, Michigan was riding high on its favorable image as a hospitable place to raise a family and start a business. But even before this recession, all was not perfect. Many Michigan families still struggled with high tax bills and poor schools. A much-improved environment could still use a boost from regulatory and other reforms. Michigan is definitely better off today than it was a short decade ago, but much can yet be done to make it even better. Schools can improve, taxes can be lowered, workers can assume greater control over their paychecks, and government can get smarter at the same time that it gets less intrusive.
. . . a wise and frugal government, which shall restrain men from injuring one another, shall leave them otherwise free to regulate their own pursuits of industry and improvement, and shall not take from the mouth of labor the bread it has earned. This is the sum of good government . . . . Does the item weaken communities by assuming a responsibility best left to private families, charities, or firms? Does the item duplicate what other state agencies or the federal government are doing in that area? Does the item primarily benefit a single favored constituency or region rather than the state as a whole? Are direct users or beneficiaries of the service paying a reasonable amount of the cost? Does the item create or expand an "entitlement" that cannot be reasonably withdrawn if necessary or advisable in the future? Has the item received significantly more money in recent years but not used that money in the most effective way? Has the item been funded in the past by deceptive or inappropriate legislative or executive actions? Does the item use taxpayer funds for political advocacy or to discriminate against racial or ethnic groups? Does the item discourage self-help and personal independence unnecessarily or encourage reliance upon government? Does the item yield benefits commensurate with costs? ensure that every act of state and local government in Michigan adheres to the highest principles of sound economics, good government, and proper constitutional authority. In the sections that follow, the Mackinac Center for Public Policy offers 77 specific ideas for the new Legislature and the governor to act upon. The recommendations in this report represent not the final word, but rather a starting point for positive public policy change. 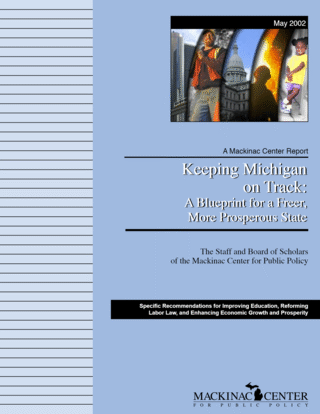 The Mackinac Center for Public Policy will continue in the coming months to elaborate on these proposals and suggest others for a better Michigan.